This weekend I enjoyed a ride out with friends on my horse Rowan past the beautifully restored medieval farm House at Allt-y-Bela which, at this time of the year is surrounded by a breath taking carpet of snowdrops. Seeing the drifts of snowdrops in the woodland around Allt-y-Bela, reminded me that Spring is not far away and in a couple of months we can look forward to the appearance of another of my favourite wildflowers the bluebell. We are very lucky in Monmouthshire to have many ancient deciduous woodlands in which bluebells thrive. There are numerous sites you can visit and walk in late Spring, taking in their heady beauty and scent, which I'm not ashamed to admit, has been known to move me to tears. 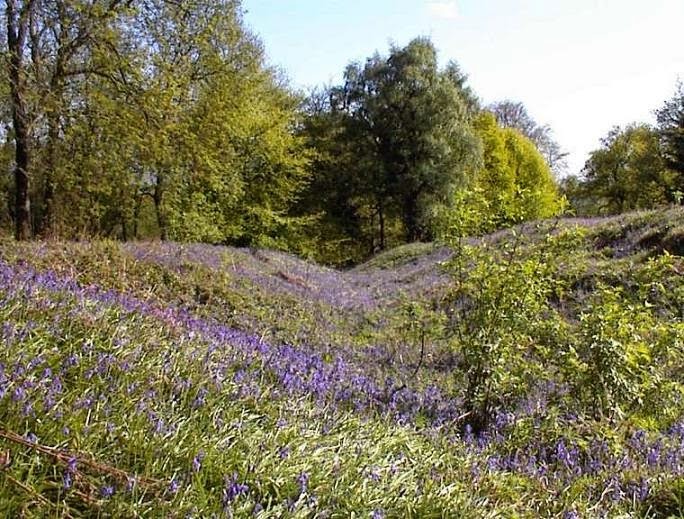 One of the best known sites with free and open public access to see bluebells is at Coed-y-Bwynydd. Coed-y-Bwnydd (which translates as ‘wood of the gentry’ from the Welsh Language) is situated high on a wooded promontory, 196m above sea level, overlooking the Usk Valley and village of Bettws Newydd close to the Clytha Estate between Usk and Raglan. A popular destination for walkers, Coed-y-Bwynydd is most famous for the carpet of bluebells which emerge there each Spring, but there are also many other wild flowers here including primroses, orchids and red campion. Photos taken April 2014. From Coed-y-Bwynydd and the lanes approaching on either side, particularly the lane leading down to Clytha, there are beautiful views over the surrounding countryside across the Usk Valley towards the Black Mountains and Brecon Beacons. The views across the Usk Valley are truly stunning. More than 2,000 years ago this was a large, multivallate Iron Age camp proected by a series of manmade ditches/ ramparts and a massive earth mound at the entrance and by the very steep natural incline, particularly on the north western sides overlooking the Usk Valley. 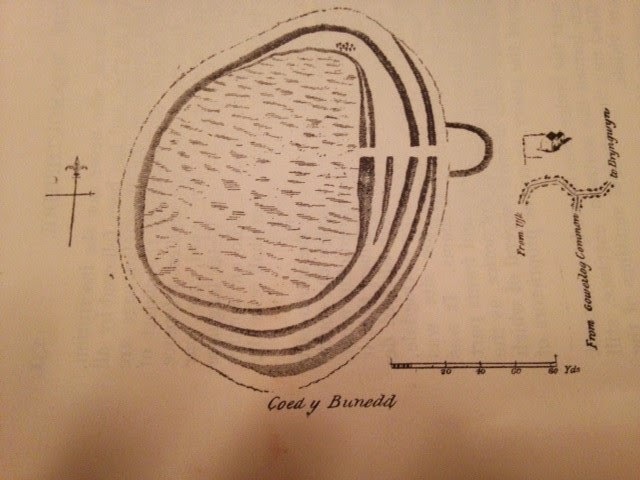 Excavations between 1969 and the 1970s revealed four roundhouses, and evidence that the fort was occupied by Silurian tribesmen over a considerable period of time. Information boards at the entrance to Coed-y-Bwynydd show a plan of the site as it would have been. Archdeacon William Coxe wrote about the 'ancient encampment' of Coed-y-Bwynydd on his tour of Monmouthshire in 1801. Like modern day visitors he was clearly very taken with its position. "The encampment of Coed y Bunedd is formed on the summit of a commanding eminence, at the extremity of Clytha hills, about four miles from Usk, and to the West of the turnpike road leading to Abergavenny; it is a small camp of 480 yards in circumference within the ramparts, but of considerable strength. The western and northern sides being precipitous are bounded by a single entrenchment; the other sides are fortified with triple ditches and ramparts. The entrance is covered by a tumulus which rendered the access extremely difficult, and appears to have been fortified at each extremity with towers, of which the foundations still remain. It was originally strengthened with walls, and many of the stones lie scattered on the sides and tops of the ramparts. ......... The Western side overhangs the meandering Usk, and commands a beautiful view of the northern parts of the county, which will amply repay the traveller for the trouble of ascending the summit." The deep defence ditches can still be clearly seen today. Be warned, the approach whether from Clytha or Bettws Newydd, is up a steep narrow lane with limited passing places and very limited room for parking on the roadside adjacent to the entrance marked with the National Trust sign.